As of the 20th of this month, it is officially spring! That means blooming flowers, chirping birds, and, of course, spring cleaning. Spring cleaning is a routine (and tradition) that we understand here at Maxi Maids – your Springfield source for cleaning services. It’s the perfect time to shake off the dust of winter and gain a fresh perspective on the year. That makes spring the ideal time to downsize. 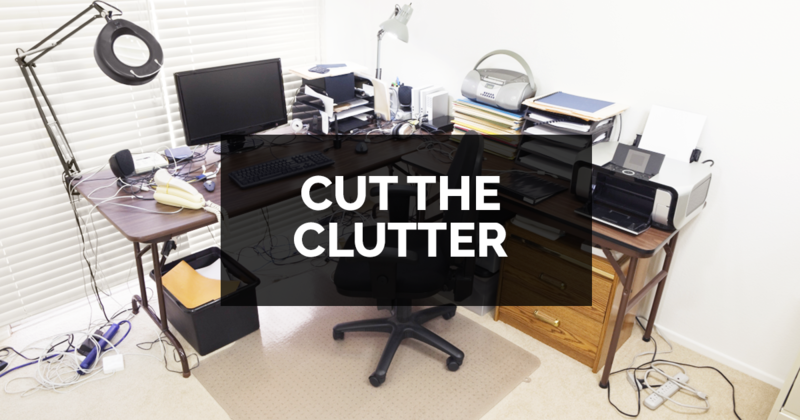 That’s why we’re talking about tips you can employ to cut the clutter that’s accumulated around your house. Let’s dig in! If you have a wardrobe that’s dominating your life, and clothes that are pouring out of your closet, try out the hanger trick. Place all of the clothes that you can hang on a hanger. However, instead of hanging them normally, turn the hanger backwards and then hang your article of clothing. When you use any of the clothing that you’ve put on your hangers, go ahead and turn the hanger the proper direction. Now, go mark your calendar. Set yourself a reminder to check your hangers in a year’s time. If you have any clothes that have gone unused for a full year, they’ll still be sitting in your closet facing the wrong direction. Pull those hangars off the rod, and think about donating the clothing that’s been neglected. If you have any seasonal items, they may be an exception to the rule (e.g. ski pants that you just didn’t get to use last year). Take a true assessment of all of the stuff you have in your home. Those things that occupy the deep, dark corners of your cabinets and closets. What about those decorations that collect dust on your mantle? How many non-perishable canned foods do you have just sitting on your shelves day in and day out? Encourage the whole household to assess the belongings in the house. Donate any and all things unimportant and superfluous. While it’s sad to quit a project, it’s healthy to move on from a project that you just won’t complete. If you have projects piling up in the garage, it might be time to give in and abandon a project or two. Do you have a painting studio that’s littered with unfinished canvasses? It may actually help your productivity to abandon those projects that no longer inspire you. Think about it this way: Which is easier: Reading 5 books in succession from cover to cover? Or switching back and forth between 5 books until they’re all completed? Gain clarity, and declutter, by abandoning projects that have truly fallen by the wayside. Then, you’ll have more time, and full concentration to dedicate towards projects that you fully intend to complete. Scrap those excess projects, and donate what you can. So you’ve cut the clutter around your home! Kudos! That’s an enlightening, weight-off-the-chest feeling! Finally, you can navigate from your bedroom to your kitchen without stepping over a pile of clothes! Once you’ve scoured through your possessions to cut the fat that’s harbored throughout your abode, it’s likely that you could use a professional cleaning. That’s why we’re here! Once all the dust has settled from your spring declutter, you can count on Maxi Maids for a full, thorough spring cleaning. Get in touch with your local, Springfield maid service, or make a reservation for our house cleaning services!